Come join me over the 2019 chinese new year holiday week for a spectacular 5 day birding trip across Cambodia . Be awed by the largest waterbird colonies in Southeast Asia at Prek Toal , the elegant flocks of Sarus Cranes at Ang Trapaeng Thmor and get up close with the Giant and White Ibises in the Northern Cambodian Forests at Tmatboey. Perhaps we maybe lucky enough to view all 307 species of birds in the region during the trip ! The tour will be conducted by professional bird guides from the Cambodia Bird Guide Association (CBGA) . If this is your first time visiting Siem Reap , you may also wish to extend your trip to visit the UNESCO site of Angkor Wat complex prior to or after the trip . Prek Toal Bird Sanctuary (largest waterbird colonies in South East Asia) . Ang Trapaeng Thomor - Saurus Cranes and Eld's Deers . Florican Grassland - Bengal Floricans . Tmatboey - Giant and White Shouldered Ibises . Beng Mealea , Koh Ker Temples . 5 Feb Tue : Day 1 - Depart Singapore 2pm - Arrive Siem Reap 3.15pm . Jetstar Asia . Free and Easy program rest of day . Overnight Sonalong Boutique Hotel . 6 Feb Wed : Day 2 - Prek Toal – Large Waterbird Colonies . We will start our day trip to Prek Toal bird sanctuary at 5.30am with our CBGA bird guide in private air- con car and travel to the port of Me-chrey. We will travel by boat to Prek Toal, Tonle Sap where we will see the largest waterbird colonies in Southeast Asia, the flooded forest and the floating village. 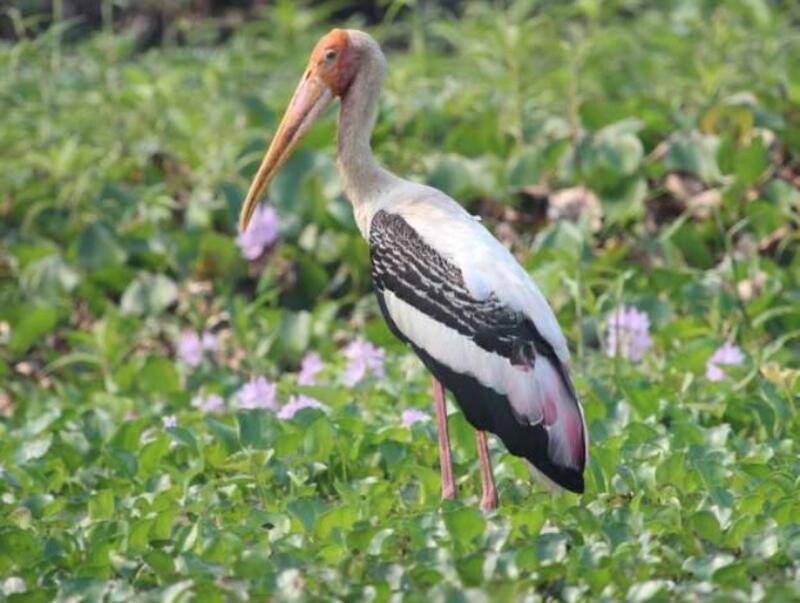 The sanctuary harbours seven species of water birds of global significance: Spot-billed Pelican, Milky Stork, Painted Stork, Lesser Adjutant, Greater Adjutant, Black-headed Ibis, and Oriental Darter. There is a globally significant population of Grey-headed Fish Eagles at Prek Toal. Over 150 species have been recorded in the reserve. The Prek Toal area consists of seasonally inundated freshwater swamp forest with a high botanical diversity. Short tree shrub makes up most of the landscape, forming a dense under-story with scattered large trees, which form the vital nesting ground for large water birds. Prek Toal is unmatched throughout South East Asia for the number and populations of endangered water birds it supports through the dry season. Large flocks of Cormorants, Storks and Pelicans are almost guaranteed from January to May, along with Herons, Egrets and Terns. We will return to Prek Toal Village for an early lunch in the village after the morning bird watching session. After lunch we can take an optional paddle boat tour of the floating village which if not seen before is a unique experience. Return to Siem Reap . Overnight Sonalong Boutique Hotel . Bird Colony at Prek Toal / Greater Adjutant. We will depart at 5.30am today , and drive 2 hours west of Siem Reap within the Tonle Sap floodplains to visit Ang Trapaeng Thmor (ATT) , stopping along the way for bird watching at a few spots . Originating as an ancient Angkorian reservoir northwest of Siem Reap, ATT was rebuilt as by slave labour during the Khmer Rouge regime in 1976 and finished with assistance from the Japanese, post-war. 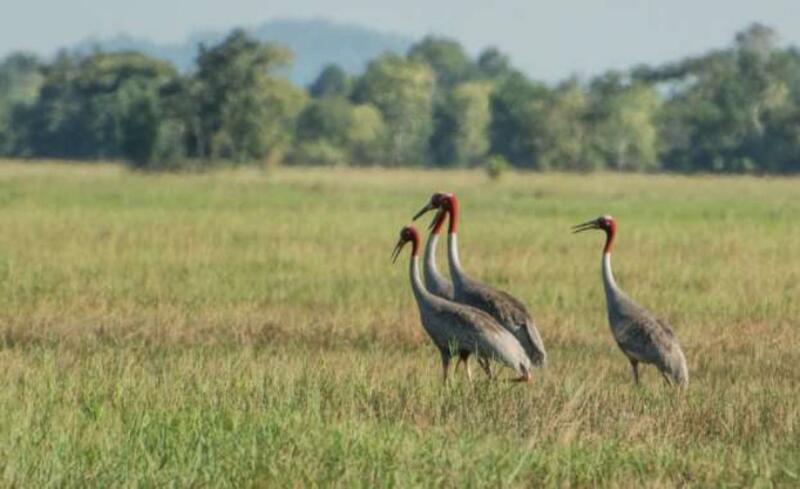 The reservoir is now a Sarus Crane reserve administered by the Forestry Administration (FA), with over 300 of these magnificent birds congregating to feed each dry season. Over 250 species have been recorded from the site, 18 of which are globally threatened. By February the dry season will be well underway and a few pairs of Black-necked Storks frequent the site along with many of the large water birds seen at Prek Toal; Black-headed Ibis, Milky and Painted Storks, Spot-billed Pelicans, Oriental Darters, Asian Openbills and Greater and Lesser Adjutants. A few pairs of Bengal Floricans breed here during the dry months, though they are a treat rather than a certainty to see. Other grassland specialists include Red Avadavat, Blue-breasted Quail, and the 3 species of lark occurring in Cambodia. 6 species of duck, including the resident Comb Duck, can be seen along with birds of prey that are rare in the much of the country such as Black Kite, Greater Spotted Eagle, Short-toed Eagle, Eastern Marsh & Pied Harriers. Numerous waders, rails and shore birds can be found in the marshy belts of aquatic habitats. The critically endangered Eld’s Deer can often be seen in numbers, at times exceeding 20 individuals, from February to the start of the rains in May. Birding until noon we will have lunch at ATT, then have a short nap. In the afternoon, the group can visit the silk weaving village at Phnom Srok, and or continue doing another quick birding before heading back to Siem Reap. Arrive back at Siem Reap at 5pm . Overnight Sonalong Boutique Hotel . Saurus Cranes at Ang Trapaeng Thmor. 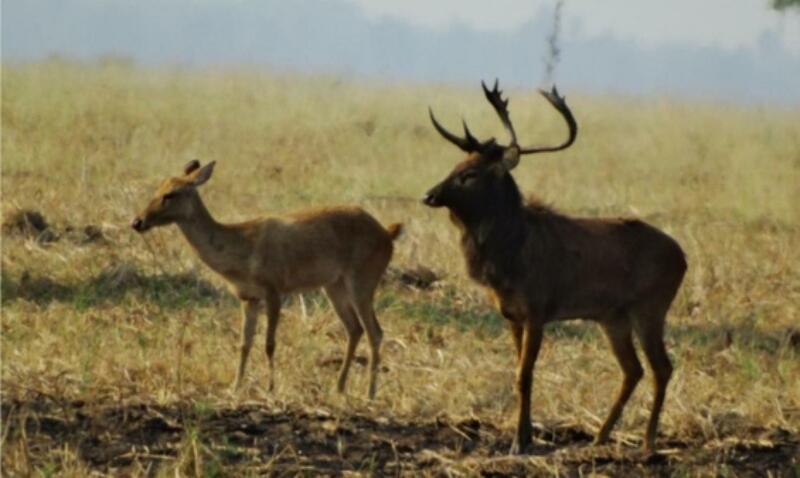 Trip will start as early as 5.30am from Siem Reap heading east along national Road 6, with approximately 2-hour drive , we will arrive at the Florican Grassland where we will spend a couple hours looking for the critically endangered Bengal Florican and other grassland species. The Bengal Florican Conservation Areas (BFCAs) is a great inundated grassland which is protected and managed for biodiversity conservation and sustainable use by local communities. The conservation areas mainly contain grassland dominant landscapes, which are now extremely rare in South-East Asia and which have been disappearing rapidly in Cambodia in recent years. The target species at this site are Bengal Florican, the rare wintering Manchurian Reed-warbler, Raptors including Greater Spotted Eagle and Imperial Eagle, Pied Harrier and Eastern Marshharrier, Siberian Ruby Throat, and Small Buttonquail. After visiting the Florican grasslands the group will travel toward Tmatbeoy village passing by Beng Mealea and Koh Ker temples (if time allows we will break the journey with some birding at these temples). The group will have lunch en route near Koh Ker before arriving at Tmatboey Eco-lodge around 3pm in time for the first afternoon birding near the lodge with a short-walk through the open forest to where the White- shouldered Ibis come to roost at sunset. Tmatboey is a remote village of 314 families situated in the Northern Plains of Cambodia, within the Kulen Promtep Wildlife Sanctuary. Tmatbeoy is the most significant ground for the two critically endangered Giant and White-shouldered Ibises. The conservation project was set up by the Cambodian Government (ministry of environment), conservation NGOs and Tmatboey village.The group can discuss with the CBGA guide how they wish to spend the day outside the sunrise and sunset birding. Packed lunches can be arranged if they want to spend more time in the forest and night drives / walks can be arranged to spot owls and Savannah Night Jars. The village of Tmatboey is remote and self- sufficient. CBGA organises an optional village tour, which covers local trades as well as the school, a market garden, a still for sugar palm wine and points out the projects that the visitor’s conservation contributions have assisted. Left : Manchurian Reed Warbler . Right : Bengal Florican . 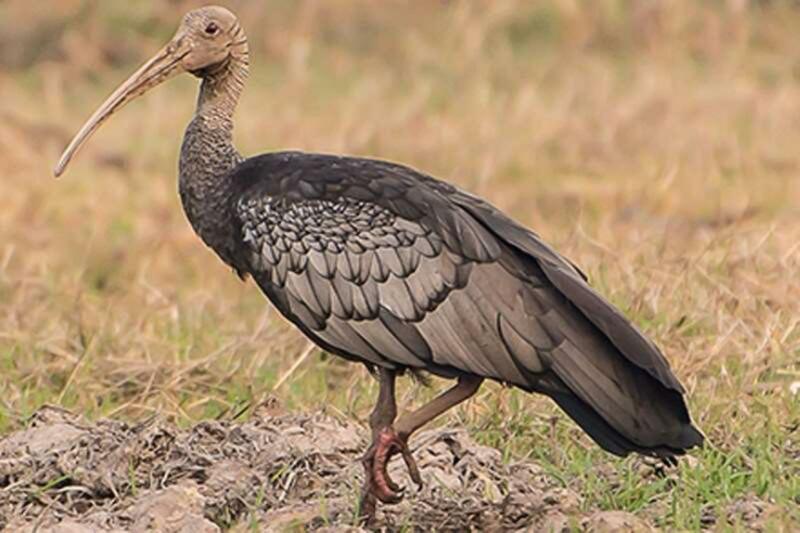 In the morning the group will leave the lodge very early, around 4 or 4:30 a.m., with a quick cup of tea or coffee, and packed breakfast , then a drive and a walk to less disturbed areas of the forest where Giant Ibis have been located. We return back to the Lodge around noon for lunch and nap before we continue for another afternoon birding. 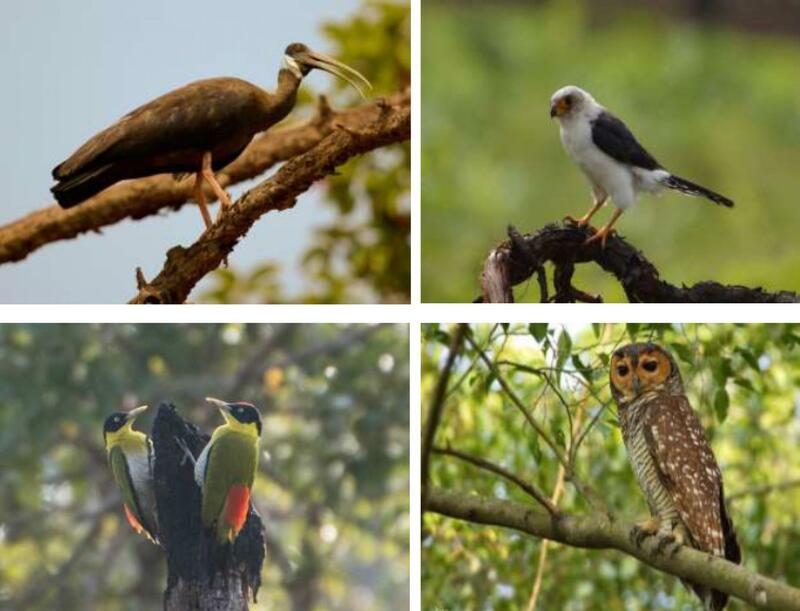 Tmatbeoy also supports other target species such as Woolly-necked Stork, Indian Spotted Eagle, Grey- headed Fish Eagle and White-rumped Falcon. The Pale-capped Pigeon is another highlight along with an amazing diversity of woodpeckers. Our local guides have made a special effort to find owls on their night roosts, allowing comfortable daytime viewing of Brown Fish Owl, Spotted Wood Owl and Brown Wood Owl. Within this 2 nights birding trip at Tmatboey, you will have enough time to see all the species at Tmatboey at no rush. We will spend the whole day birdwatching in the Deciduous Dipterocarp forest to see other birds including the target species above. We will also stay late in the forest until dark to view Nightjars (Sovanna and Large-tailed) and Owls (Oriental Scops Owl and Barn Owl). Hence a headtorch / torch is recommended for night bird watching . 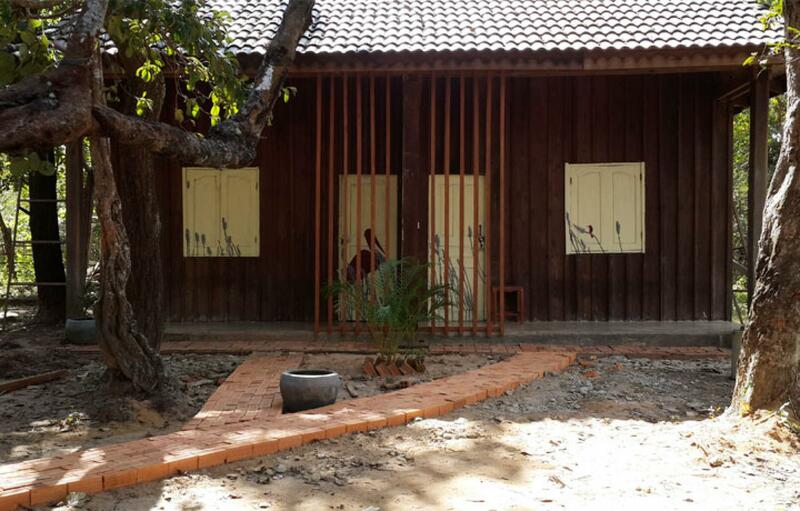 10 Feb Sun : Day 6 – AM : Tmatboey . PM : Travel back to Siem Reap. After a final round of birding in the morning , followed by lunch, we will leave Tmatboey by 1pm and head back to Siem Reap. On the way back we can arrange to visit Beng Mealea temple. Arrive back in Siem Reap at 5pm. Overnight Sonalong Boutique Hotel . Please RSVP as soon as you can , for Tmatboey , ideally I would need confirmation latest 3 months before the trip ie by 5 Nov 18 as Tmatboey Eco-lodge would be booked out by then . Most CBGA trips occur in the cool dry season from December to March. This is the best time to visit Cambodia when the daytime temperatures are low thirties and the heat is dry. Nighttime temperatures are typically in the low twenties though occasionally a cold snap will drop to 13 or 14. By the end of February / beginning of March the temperature has started to climb both day and nighttime reaching a peak in April / May. Loose natural cloth clothing (with a hat) is most comfortable giving protection from the sun and mosquitoes. Most things are available in Siem Reap usually cheaper than in Europe or America but if your schedule allows little time the usual items for hot country countryside will help make your trip enjoyable; sun cream, mosquito repellent, a torch and earplugs. During the course of the itinerary CBGA Groups encounter a range of different habitat; Florican Grasslands – Natural grassland and paddy on floodplain. Tmatboey – Deciduous dry dipteropcarp forest (DDF). DDF with pockets of mixed evergreen and forest trapaeng (pools). Bird watching is from the car, and on foot. Hiking boots, which give ankle protection against the small risk of snakebites are recommended for the forest walks. CBGA has a couple of scopes, which it will try to allocate if the group has not brought one however in peak season they may have already been taken. - Our guide will try his/her very best to show us the most desiderated and most rare birds mentioned here, but one cannot guarantee them in every case. - Cambodia is a noisy country with amplified weddings and funerals even in the most remote villages so earplugs can greatly assist sleep. - As with all sub & tropical climates the sun is fierce and can quickly burn those from more temperate climates so a high factor sunscreen is recommended. - Most of these trips occur during the dry season when mosquitos are reduced in number but it is always advisable to carry repellent and wear long light loose clothing, which also gives protection from the sun. - Cambodia is a hot country even in the relatively cooler dry season and your water intake will need to increase accordingly together with rehydration tablets (an excellent local rehydration product Royal D is cheap and widely available). - Most things are cheaper in Cambodia so unless your schedule prevents it you can save money and baggage allowance by buying most drugs, sun screens and clothing including hats in Siem Reap or Phnom Penh though note that some pharmacies may sell counterfeit products so check with the hotel for outlets selling the genuine article (A reliable chain of pharmacies called U Care are open in Siem Reap and Phnom Penh). - US dollars are interchangeable with the local currency Riel (approx. 4000 Riel / 1 USD) and accepted at all outlets though it is helpful to have plenty of one dollar bills for tips in the towns and low cost items in the countryside. Change of less than a dollar will be given in Riel. - ATM’s are widely available in Siem Reap giving USD against most credit and even debit cards though a fee is incurred for using an international card. - Cambodia and Siem Reap in particular are relatively safe for both person and belongings despite the disparity in wealth between tourists and Cambodians. The usual common sense rules apply, don’t flaunt expensive items or cash especially late at night. Photo Credits : Cambodia Bird Guide Association .